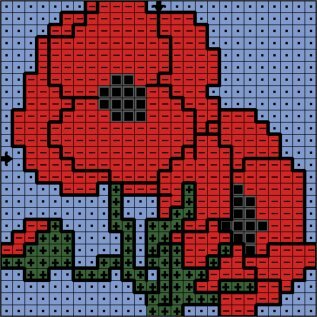 Let's start our free printable plastic canvas patterns section with a poppy design. This coaster is easy to stitch using tent stitch and could be tackled by a beginner to the craft of needlepoint. This form of canvas is moulded rather than woven and can be cut into shaped pieces for three dimensional items, such as tissue boxes or dollhouse furniture without risk of fraying. You do not need to sew pieces together for this design, just stitch over the edge and use it as a coaster under your hot drinks to protect your table top. Although you could stitch four coasters and a plain base and then sew them together to create a pen tub or container. Where can I get my supplies? The first of our free printable plastic canvas patterns is worked from the chart above. Having large holes the canvas is ideal for children or the visually impaired, but of course it can be enjoyed by anyone. The squares and circles I linked to above, save time as you do not need to cut the shape before you can stitch. But for economy you can buy the larger sheets, in a number of colours and cut to shape yourself. The craft mesh is also available in a 10 count size which will result in smaller finished pieces. 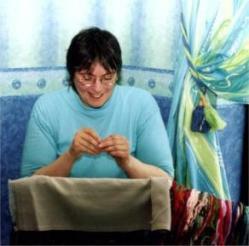 Threading wool into your tapestry needle can be tricky so you may like to use a needle threader. To use the type shown in the photograph, push the smallest end of the threader through the eye of the needle. Poke the yarn through the hole in the end of the threader, then pull it back firmly, leaving the yarn threaded through the needle ready to use. If you don't have a threader you can use a piece of folded paper for the same purpose. Cut it narrow enough to fit through the eye of the needle and sandwich the end of the yarn between the fold. Pass the paper through the needle and the yarn will go too. Begin by threading the needle with the blue yarn and stitch the first 7 stitches in the top left hand corner of the chart using one of the three types of tent stitch. Change direction and work the 5 blue stitches underneath. Continue in this way until your blue thread runs out, following the blue squares on the chart. 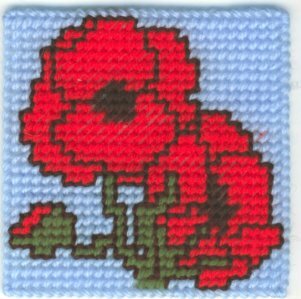 Then you can change to red yarn and start working on the poppies themselves. Do not work a row of the plastic canvas at a time, instead work in blocks of color. When all the tent stitches are in place, you can thread up with black yarn and outline (optional) using back stitch. To complete your coaster work an overcast stitch in blue over the edge.